If you have only ever known a time in the R/C era when 2.4 GHz, spread spectrum radios were in use and not only there no interference issues, but there were no licenses required, either, for legal operation, then it might be hard to imagine when this was not so. Most people in the R/C realm at least remember the 72 MHz frequency band where each system operated on a specific center frequency, where no two system could be operated in the same vicinity. Before that there was the 27 MHz band, which is where I began, more specifically on 27.195 MHz (solid green frequency indicator flag). Only five frequencies were reserved by the Federal Communications Commission (FCC) exclusively for radio control use. That meant never more than five planes in the air, or even being worked on with the radio on, at a time. The band was part of the original Citizens Band (CB) radio allocation. Commercial CB radios were notoriously lousy at controlling bandwidth and often overlapped the R/C bands with enough power to cause deadly (to a model) interference. My FCC operator's permit, obtained sometime around 1972, is long gone, but I definitely remember at around age 14 feeling quite 'special' when it arrived in the mail. "I'm a law-abiding citizen and I want to get the proper license to operate my R/C transmitter. But I've sent in forms three times, and every time they were returned as incorrect. Will someone please tell me how to do It right!?" First, for most R/C equipment, you definitely do need a license of some sort. Most R/C transmitters operate under the so-called Citizen's Radio Service, but quite a few work on one of the Amateur Radio bands. You may hear it said that it's quite OK to operate an R/C transmitter without a license; except as noted below this is simply not true. You can, however, operate without taking any sort of examination to get the necessary license; this is the object of the Citizen's Radio Service, generally referred to simply as "Citizens Band." To operate on the Amateur Bands you do have to take an exam to get the required license, but, even here, things have been simplified. There are certain transmitters that you can operate without taking an exam or having a license. So far there are only a couple of these on the market but their numbers will probably increase. They are legal under Part 15 of the F.C.C. rules and there are very definite requirements for them. 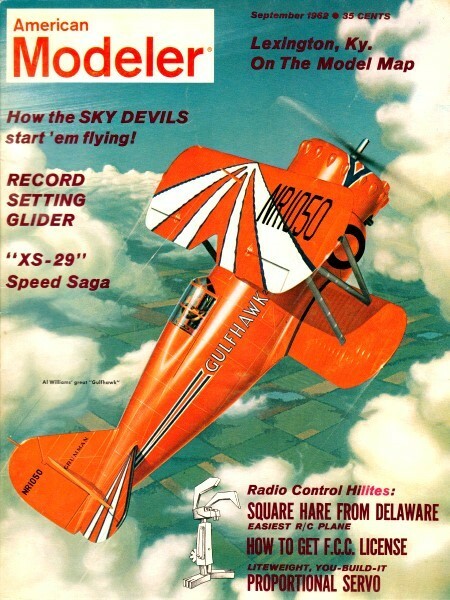 The Citizens Band covers transmitters used for communication and other purposes, as well as for R/C. Those licensed for the latter are termed "Class C" transmitters; general communication transmitters are "Class D." Both of these classes operate on frequencies near 27 mc. "Class A" transmitters are for communication uses, but their operating frequencies are near 465 mc. "Class B" transmitters may be used for R/C, also work on 465 mc, but are subject to quite a few restrictions - so much so that there is only one make currently available, Citizen-Ship Radio Model CC-1. Rather tough technical specs, and the fact that the transmitter has to be checked by the F.C.C. for compliance with these specs, has limited the use of 465 mc, but the spot is still available for radio control, may be of interest to those who suffer bad interference on the 27 mc frequencies. It should be understood that Citizens Band operation is something like a telephone "party line"; the F.C.C. has set aside certain frequencies but makes no guarantee that you won't have interference. You have no more and no less rights on them than the many thousands of other users, both R/C and otherwise. Actually, of some 28 spot frequencies set aside within the range from 26.965 to 27.255 mc, five have been designated as for R/C uses only; one spot (27.255 mc) may be used by both Class C and Class D transmitters. This sounds a little like Utopia. We have our own private R/C spots! True, but the joker here is that very few of the receivers currently employed for R/C can separate much more than the two extreme high and low R/C frequencies - and many can't even do that. However, equipment is on the market that can separate all the R/C spots frequencies, and more will be coming. The vast majority of R/C receivers are of a style called super-regenerative; these are fairly simple in circuitry, thus quite low in cost, very sensitive, but they have poor selectivity. Now offered by quite a few makers at somewhat higher cost are "super-heterodyne" receivers, called superhet for short. These are amply selective to separate all the R/C spot frequencies, and, furthermore, some of them can operate successfully even though there is Citizens Band phone operation on adjacent channels. The superhets have other advantages too, but we won't go into them here. The R/C spots are: 26.995 mc, 27.045 mc, 27.095 mc, 27.145 mc, 27.195 mc, 27.255 mc (latter shared with Class D phones and other C. B. services). Sandwiched in between each two of the above spots are some five or so phone channels. No wonder the R/C boys have interference troubles! Only a single spot ultra high frequency, 465.0 mc, is set aside for R/C purposes, and It is also shared with phone operation. Besides operating on the specified frequencies, there are quite a few other specs that R/C transmitters must meet. They should be crystal controlled, and the crystals must be guaranteed by the maker as within 0.005% of the marked R/C frequency. If transmitter input Is less than 3 watts, 0.01% crystals may be used - actually, practically all R/C crystals are made to the closer tolerance. You are not allowed to tune the transmitter, unless the maker certifies that such tuning will not result In off-frequency operation. The transmitter must not transmit harmonics and other spurious emissions. If there is a possibility that tuning can disturb the frequency, such tuning must be accomplished by the holder of a First or Second Class radio telephone or telegraph F.C.C. operator license. All homemade transmitters and also many that are constructed from kits also require such a licensee to tune them up, unless they are based upon a pre-tuned and sealed oscillator, which the maker certifies will meet the F.C.C. specs. Most commercial transmitter kits and finished units have some sort of certification accompanying them. Make sure the one you purchase has. While all the above sounds very restrictive, present-day transmitters really are very stable. Many are enough so that if you use the exact crystals specified by the maker, you can change 'these to shift frequency, and retune the output circuits, without running a chance of offending the F.C.C. Now, how about the license you need? This is technically considered a Station license, but it doesn't license any specific transmitter. Your one license may cover several transmitters, If you have more than one, or if you purchase another at any time after the first one you get, but the number shown on the license must not be exceeded. However, note that different licenses are required for 27 mc and 465 mc; if you wish to work on both frequencies you must apply for both a Class B and a Class C license. The same application form is used for both (it is used for all Citizens Band licenses not only for new ones, but for renewals, changes of address, lost licenses, etc.). This basic form is F.C.C. #505, and you can get It at any F.C.C. office, many hobby shops, R/C suppliers, etc. The form is also packed with most manufactured transmitters and kits for same. If you can't get one locally, send to F.C.C. at address below. The forms are free, of course. At the same time you send for the form, send $1.25 to the Superintendent of Documents, Government Printing Office, Washington 25, D. C. for Vol. VI of the F.C.C. rules; this covers Part 19 of said rules, concerned with C.B. matters. It also includes Parts 12 and 20, of no interest to you, but you can't at present purchase Part 19 separately. You could up until a few years ago, for 15c or so; you might still be able to locate some of these copies. Anyone can send for license forms, but you must be at least 18 years of age and a U. S. citizen to get most Citizens Band licenses. However, realizing that younger persons might wish to operate R/C transmitters, the Commission has dropped the age limit for Class C licenses to 12 years or over. The F.C.C. form 505 is rather formidable looking, consisting of a sheet of Instructions, a "work sheet," another large sheet and three smaller ones, with three interleaved sheets of carbon paper. Earlier 505 forms were much smaller and simpler, but don't use them; they probably will not be accepted. Tear off the work sheet and mark this up, per information below, then transfer this data to the other sheets, preferably by typewriter or by printing. Many 505 forms have been returned because some parts were Illegible. 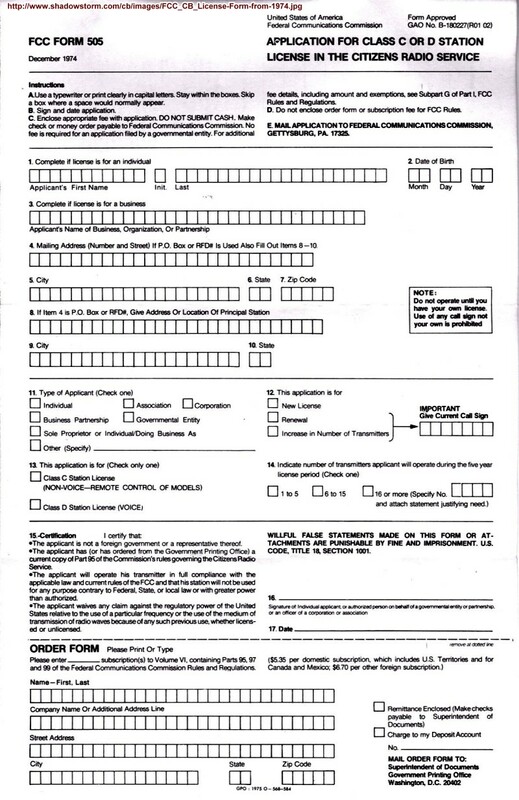 Fill out the lines as follows: Item 1, for 27 mc R/C operation, write "Class C" under both 1a and 1b, put "one" or some other reasonable number under Mobile, 1c; Item 2, your full name and address, Item 3, skip this, Item 4, put an ''X" in box 4c, for 27 mc operation; Item 5, Insert here the general vicinity of proposed operation, such as "In state of ..." or "In vicinity of ... (your home town)"; Item 6, skip this too; Item 7, yours is probably a personal application, so "X" the left-hand box; Item 8, if you own transmitter, "X" the box for "Yes" on line 8a; otherwise, put name of owner on dotted line and an "X" on line 8b, but, in any case, disregard line 8c; Item 9, this can be, "For remote control of models"; Item 10, use only if your license Is about to expire and you are applying for renewal, or if you have a change of address; Item 11, this should be "Yes", as only crystal controlled transmitters are practical for our R/C uses; Items 12, 13 and 14 should be disregarded; they do not apply to R/C. Check the work sheet most carefully, to see that all the lines are filled as described (and don't write In any we have said to leave blank), then transfer the data to the single large sheet; the carbon paper (some early blanks did not have latter - make sure yours does, or fill all the sheets individually) will take care of the smaller sheets: Be sure your answers are fully legible; better have someone else check this for you. Now take the single large form and three attached smaller ones to a Notary Public (all banks have Notaries, as do many business houses), sign the large sheet there, put an "X" In the box labeled "Individual Applicant," have the form notarized. This will cost you usually 25c, no more than a dollar. Note that In addition to swearing before the Notary that all statements on the form are true, you also swear to the fact you have a copy of Part 19 of the F.C.C. rules. 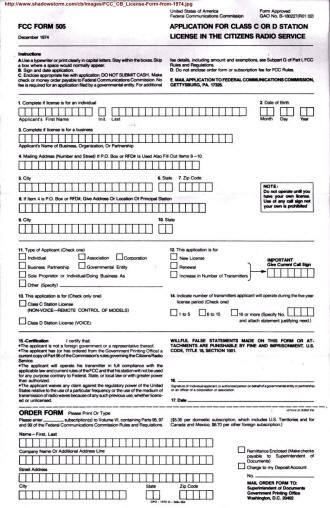 If you do not actually have a copy of Part 19, you may still file your application if you state under "Remarks" that you have ordered a copy of Vol. VI from the Government Printing Office. You should strike out the part of the Certification which deals with possession of a current copy of Part 19. The "Remarks" area is on the reverse side of the large sheet; individuals are not required to fill out any other areas on this side of the sheet. Send the completed forms to the Federal Communications Commission, Washington 25, D. C. Do not send to any local F.C.C. office, even though you may have obtained the forms there. It will take some weeks for your license to come back, possibly as many as eight or more, depending upon how rushed the F.C.C. headquarters may be. You are not authorized to operate the R/C transmitter until you have received your license. However. a friend can allow you to operate his licensed transmitter, provided he is always present to supervise the activity. As noted, there is no actual cost for the license itself, though to get it you must purchase the $1.25 Vol. VI of F.C.C. rules, and the notarization will cost a small sum. At present, F.C.C. licenses are given to anyone for any purpose with· out cost. It is likely that this state of affairs will change, but doubtful that the Citizens Band license will cost more than a dollar or two, at most. All C. B. users are required to monitor the Conelrad frequencies, during all transmissions. These frequencies are 640 and 1240 mc and are the only ones that will be active during a national emergency. Thus, if you keep a small BC receiver tuned to a local BC station, you will be in compliance. If this station suddenly goes off the air (and others except on the above two frequencies do so too) all types of transmitters should be turned off.